When they were growing up, Bob and Joe Switzer wanted different things. Bob wanted to make his fortune by becoming a doctor, and Joe wanted to make his mark on the world through magic. At first it may seem that neither brother ended up where he wanted to be. But in that darkened basement, the Switzer brothers began to look at the world in a different light. One brother wanted to save lives. The other brother wanted to dazzle crowds. With Day-Glo, they did both. Bob and Joe Switzer grew up in Montana and California in the 1920s and '30s, sons of a pharmacist. Bob wanted to become a doctor, while his brother Joe lived to delight audiences with his magic acts. After a head injury ended his dreams of becoming a doctor, Bob had to spend a summer recovering in a darkened basement and it was then that he helped Joe experiment with blacklights as a way to improve his magic act. Under the blacklights, the brothers saw a chemical-soaked label glowing and they set about creating flourescent paints that glowed in the dark. Many businesses used their paints to decorate ads and displays, but the paints faded in daylight. After many different experiments, the brothers discovered a way to make their paints glow under regular white light. Voila Day-Glo! It's books like The Day-Glo Brothers that remind me why I love nonfiction picture books and particularly picture book biographies. The book is the perfect amount of information on a subject that I never would have thought to wonder about. Add brilliant illustrations that pair perfectly with the text and you've got a delightful reading experience. The cartoonish illustrations start out black and white. When Joe and Bob discover the glowing label, Tony Persiani adds flourescent colors. And on the spread where Joe and Bob see their first Day-Glo billboard, the illustrations burst into full Day-Glo colors. I think this is a perfect story to capture the imaginations of kids. I mean, inventing a new color? What a cool thing to do with your life! At the end of the book, Chris Barton includes information about how regular flourescence works and how daylight flourescence works and an author's note that details his research. Since there were few books available about Day-Glo, much of his research came from interviewing and speaking with Switzer family members and people who knew the Switzer brothers. Very cool. Check out more reviews at BoingBoing and A Fuse #8 Production, and here's a Cynsations interview with Chris Barton. (Um, and especially check out the interview because she's giving out five signed copies of The Day-Glo Brothers, deadline to enter is July 31!) 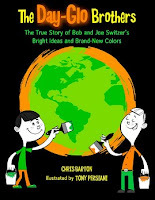 Chris Barton and Tony Persiani were also featured on Seven Impossible Things Before Breakfast, so check that out, too. Happy Nonfiction Monday! Scrub-a-Dub Tub's got the roundup. Abby, I love your review and all of the extra links. This looks like it would have lots of potential in elementary classrooms.